Scout Inducted Using Sign Language. (P6)..1981..08.12.1981..12.08.1981..8th December 1981..Joe Needham, a deaf and dumb resident in Stewart's Hospital, Palmerstown, Co Dublin was enrolled into the 43rd Dublin (Palmerstown) unit of the Scouting Association of Ireland. The Chief Scout, Mr Joe McGough carried out the enrollment at the hospital. 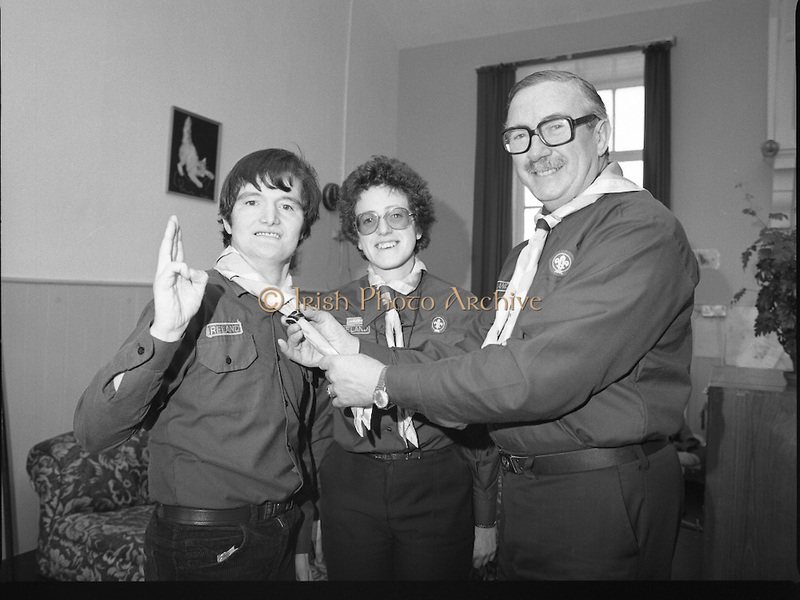 Ms Domenica Malocca, a teacher in the class for the deaf at the hospital, translated the Scout Promise into sign language during the ceremony...Picture taken of Joe Needham being officially welcomed into the Irish Scouting Movement by the Chief Scout, Mr Joe McGough and Estelle Feldman, Scout Leader, 43rd Dublin Unit, Palmerstown.